2.4GHz AV Sender, AWV001 - AIRWAVE Technologies Inc. This wireless AV sender sports a new industrial design with a hidden omnidirectional antenna. It consists of one transmitter with a RCA input and one or multiple receivers with RCA output. 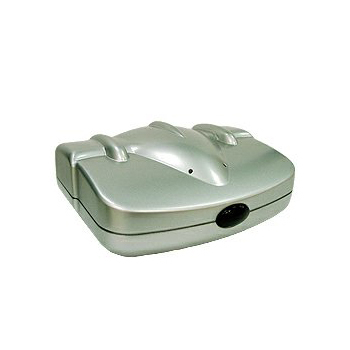 This device transmits vivid video and hi-fi stereo sound from a VCR、TV set 、LD、DVD、VCD、Satellite Receiver or cable set top box to any TV or monitor. It can also be used in conjunction with a camcorder or CCD camera and turns into a wireless security monitoring system. 2.4 GHz wireless transmitter and receiver AV Sender with 4 selectable channels. Transmitting and receiving of crisp video and hi-fi stereo audio even through walls. Long transmission range up to 400 feet clear line-of-sight. Local area broadcasting of audio/video programs for multiple viewers even in different.